IMAK Smart Glove Wrist Support from HealthyKin.com helps prevent and relieve wrist pain associated with CTS, arthritis and tendinitis by encouraging proper hand and wrist position. The IMAK SmartGlove features a flexible support splint; washable, breathable cotton Lycra for all day comfort; and a massaging ergoBeads pad under the wrist, which cushions and improves circulation. Use SmartGlove for carpal tunnel syndrome, arthritis, tendinitis, hand fatigue and other wrist and hand pain. First I would like to mention your website was the only one that carried all three sizes and provide directions to determine the correct size. The product is great. 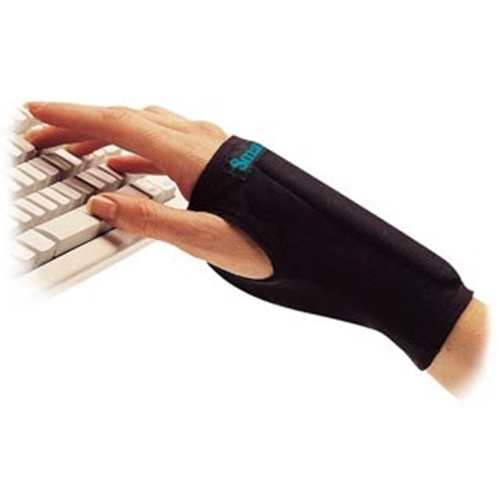 It is comfortable to wear and it relieves the pressure on your palm, wrist and arm. I highly recommend this product. I have used IMAK smart glove for several years and find it useful for controlling carpal tunnel discomfort. I was glad to find it on linde as it is not generally available here in Louisville. This has been a great relief for my wrist at work. I have had customers ask where I purchased the wrist support and I always recommend IMAK. I love mine especially for computer and iPad. Great glove for a great price. Your site is just what we needed for my health issues. This glove is the best thing I have found for my wrist.